The Creative (CND) nail extensions are of superior quality, we have a lot of colours to choose for a tip or why not have them natural looking. Express Manicure: Tidying of the cuticles, filing, buffing and a polish. Luxury Manicure: Tidying cuticles, exfoliation with a hand scrub then a hand mask and mittens. Then enjoy a relaxing lower arm and hand massage and finish with a polish. 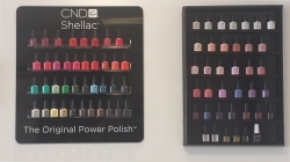 Shellac is an incomparable high-gloss shine polish, it has a zero dry time and on good nails can last 14 days, or why not try Rock star nails, choose from our selection of glitter and go wild with bling. Keep up with the celebrity's like Beyonce and try Minx they come in many colours and patterns. Luxury Pedicure: Say goodbye to rough, dry skin and say hello to smoother, softer skin with a lovely revitalising foot treatment. To include conditioning of cuticles, shape and exfoliation. Followed by a relaxing lower leg and foot massage and polish. To arrange for one of our team to look at your nails, or to book one of our treatments in Estover, contact Bronz N Beauty Ltd today. You can reach our beauty salon by calling 01752 766655, or by sending us an email via our Contact Us page for further assistance.